Educational Qualification : Passed Post Graduation in Arts/Science/Commerce/AG/ Management or Equivalent from any Recognized University and Working Knowledge of Computer Operation. 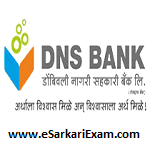 Eligible Candidates can Submit Application at the Official Website of DNS Bank latest by 13th Sept 2018. Applicants First Logon to DNS Bank Official Website. Click on Recruitment for Assistant Manager Link.